Aldershot Town have confirmed manager Kevin Dillon and assistant Gary Owers have left the club by mutual agreement. The Shots, who reached the League Two play-offs last term, fell to a fourth straight home defeat in the league on Saturday and lie 20th in the table. Aldershot chief executive Peter Duffy told BBC Surrey: "It was a very difficult decision. We've thought about it for a little time. "Ultimately it's the right decision. It's tough, but it had to be taken." He added: "There are a number of factors I took into account along with the board. "They relate to the philosophy of the club, the points we've accrued so far, how we're doing financially, the stock of players we have and can attract, and ultimately to the perceptions of stakeholder, and supporters. "Taking all those into account helped me arrive at this decision. This is a decision based upon where we want the club to be. "We hoped to be challenging for the play-offs. We still believe we can achieve the play-offs." 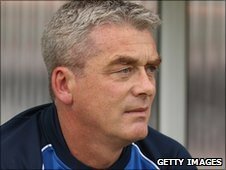 Former Birmingham, Portsmouth and Newcastle player Dillon, 51, was appointed in November 2009 after Gary Waddock left for Wycombe Wanderers. He was a coach at Reading under Steve Coppell and the Shots were his first managerial appointment. Newport Country boss Dean Holdsworth has been linked with the role.